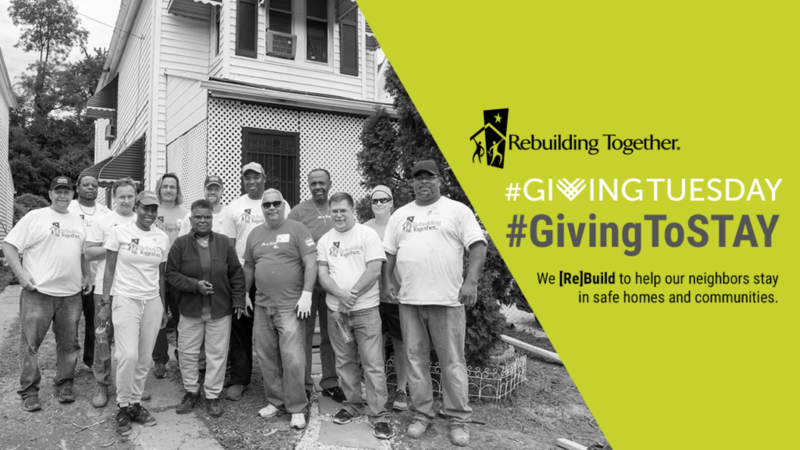 Why are we participating and why Rebuilding Together? Rebuilding Together Howard County is part of a national network of over 130 affiliates nationwide committed to providing safe homes and communities for everyone. For over 30 years, the Rebuilding Together network has worked with four million volunteers to repair and renovate more than 200,000 homes, nonprofit facilities and community spaces, impacting nearly six million people. Join us on Giving Tuesday for our #GivingToStay campaign to help us do more in our community! We envision safe homes and communities for everyone, which often means rebuilding to help our neighbors in need stay safely right where they are. Our repairs promote mobility and reduce how often older adults fall at home. In fact, two-thirds of the homeowners who have received repairs by Rebuilding Together report they feel safe and can move around their homes more easily. The work of Rebuilding Together Howard County helps families remain in the same home to provide stability as their children attend school. We serve the older adults who have been a part of the neighborhood for decades and are facing the pressures to move due to gentrification, lack of mobility or needed critical repairs. We empower those with disabilities or injuries to live at home safely. Support our community on November 27 by clicking here and making a donation. With your help, we can help our neighbors stay safely in Howard County.